Dr. Stone is Senior Vice President and Chief Scientist for Oceans with Conservation International. Before that he was vice president of Global Marine Programs at the New England Aquarium. Since 2000, Dr. Stone has led the effort to create the world’s second largest marine protected area (an area about the size of France) around the Phoenix Islands in the country of Kiribati and was named one of the National Geographic Society’s Heroes of 2007 for this accomplishment. His work was featured in the September 2008 Smithsonian magazine cover story “Victory at Sea,” and he also wrote about the Phoenix Islands in the February 2004 and January 2011 issues of National Geographic magazine. Greg Stone was named one of the finalists for the 2008 Boston Globe Magazine’s “Bostonian of the Year” for his work in ocean exploration and conservation. Greg is an ocean scientist who has written prolifically for science and popular publications, including Nature and National Geographic Magazine. He was senior editor of the Marine Technology Society Journal for six years. 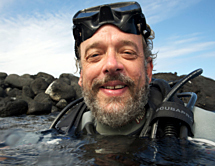 He has lectured worldwide and produced an award-winning series of marine conservation films. His Antarctic book Ice Island won the 2003 National Outdoor Book Award for Nature and the Environment. He is a specialist in undersea technology and exploration, using deep-sea submersibles, undersea habitats and SCUBA diving in all oceans of the world. While living in Japan, he established a cooperative deep-sea research program between Japan and the United States. He is a SCUBA instructor and research diver with over 5,000 dives, and has lived for a month in undersea habitats. He is a National Fellow of the Explorers Club, a recipient of the Pew Fellowship for Marine Conservation and was awarded the National Science Foundation/U.S. Navy Antarctic Service medal for research in Antarctica. Dr. Stone is an honorary associate professor at the Leigh Marine Laboratory at the University of Auckland, New Zealand, and Vice-Chair of the World Economic Forum’s Global Agenda Council on Ocean Governance.